Graeme Vanderstoel and James Ivory met by happenstance in Kabul, Afghanistan in 1960, forming a life-long friendship. Vanderstoel chose to sponsor the film series James Ivory in Person in honor of his late wife Eve Vanderstoel, who was for many years a staff member at BAMPFA. In anticipation of the acclaimed director’s visit this month to introduce screenings of several of his early films, Associate Film Curator Kate MacKay asked Vanderstoel to share a few insights with us about his long-time friend. You have been friends with James Ivory for many years. When did you first meet, and to what do you attribute the longevity of your friendship? James Ivory and I first met 1960 in Kabul at the US Embassy cultural center. Jim was there to see a film and I to read on how to get across Afghanistan on my way to London. Our friendship started when Jim heard I knew the great sarode player Ustad Ali Akbar Khan, whom he had yet to meet. Jim had used his music in his first Indian-related documentary The Sword and the Flute. And Jim knew the finest sitar player, Ustad Vilayat Khan, whom I had not met, and was using him for the first documentary he was shooting in India, The Seven Cities of Delhi. This is such an important film, since Delhi at the time was still seven separate cities, now lost in a huge sprawling metropolis. By good fortune, a year or so later I was sitting outside a cafe by the British Museum when Jim walked by. He was in London to film nineteenth-century photographs for the same documentary. I happened to already know the curator at the India Office Library where he planned to shoot. So with many mutual interests we stayed in touch. In 1970 when I was on tour with the Indian Kathakali company I saw Jim in New York and asked him if he was visiting his relatives in Berkeley for Christmas. When he replied yes, I said I needed a best man for my marriage to Eve on December 23. James Ivory (left) at the wedding of Graeme and Eve Vanderstoel, 1970. Your late wife Eve Vanderstoel was a much-beloved staff member at BAMPFA for decades. What aspects of her tenure at the museum did she enjoy the most? Eve first joined BAMPFA as a curatorial assistant and years later moved to development and then finally education. I think her best memories were probably working with all the curators, especially when editing catalogs and exhibition labels. Over the years was there any particular screening or exhibition at BAMPFA that was particularly meaningful for both you and Eve? Favorite exhibition; that is a hard one. However, I expect the Chinese and Japanese paintings curated by Professor James Cahill were. Eve especially enjoyed working with Jim and knowing his family. She was delighted that Sarah [Cahill, James’s daughter] started curating the Full series performances. Looking forward to the upcoming James Ivory in Person film series (February 20–23, 2019), can you outline what most interests you about Ivory’s early films? Ismael Merchant and James Ivory. What draws me to early Merchant Ivory India films is not only my fascination with the country but the sensitivity to the visual aspects and the music. He had become friends with Satyajit Ray, a director I admired. Ray not only lent Jim his cameraman Subrata Mitra, but composed the music for Jim’s first full length movie, Shakespeare Wallah (screening February 22, 7 p.m.). James Ivory’s film The Guru (screening February 23, 7:30 p.m.) is, among other things, about the study of Indian music. 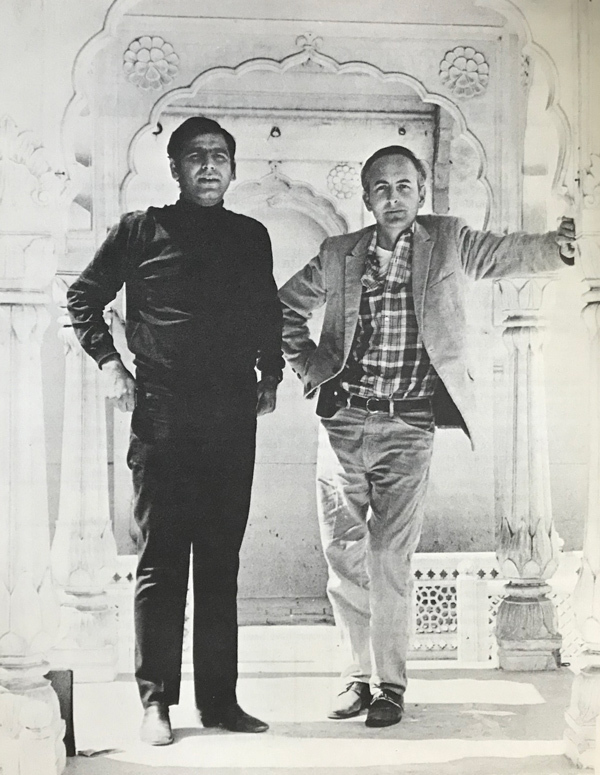 Jim was fascinated in how my friendship with Ali Akbar Khan had grown over the years and then told me that he was collaborating with Ruth Prawer Jhabvala on a film to be called The Guru. At that stage it was on a friend, not a disciple, of an Indian musician, who became his manager, as I did at the time. When the relationship between George Harrison and Ravi Shankar became so well known, my character became Tom Pickle, an English pop star who wanted to learn music from a sitar player. Jim asked Vilayat Khan and his brother Imrat to do the music. Because the main contact at Fox moved from the company before the release, it was poorly promoted and so rarely seen.